Image 1: How my ancestress might have looked. Please see base of blog for attribution – John Gurche and Tim Evanson – and for link to Creative Commons license details. I purchased the MtDNA Full Sequence test out of sheer curiosity, and I don’t regret the expenditure at all. Sometimes people ask “It is worth getting this test?”. I really don’t know how to answer this. What do you say if someone asks if it is worth buying a particular box of chocolates? Really, it depends on why you are buying it. You don’t buy a box of chocolates if you need nourishing food. Likewise, you don’t buy the MtDNA test if you are proving your recent family tree research. It doesn’t serve that purpose unless you want to know about the direct maternal line and have other family members who do it too. MtDNA is passed down from a female to her children relatively unchanged. Because of this, it has limited capability for identifying recent relations. The MtDNA of a woman and her direct maternal ancestor of three hundred years ago is very likely to be identical. But what it can do – theoretically – is trace a chain of direct inheritance back through millenia – assuming we had the samples to do it. It’s a new field and an expensive test, so the database grows very slowly. But with the few crumbs of data that I have gleaned, I have attempted to trace those long distant multi-times grandmothers of mine, and the descendants of their other daughters. Although MtDNA mostly passes from one woman to her daughter unchanged, every so often a change will occur – a mutation which becomes a new, permanent characteristic. The mutation is then passed down to the next generation, then to the next and so on. Once a mutation occurs, the first daughter to have it is no longer identical to her sister. She is still nearly identical – still in the same general classification – but just a little bit different. The new, mutated DNA gets a new name. Perhaps a whole new letter, perhaps a number or letter tacked on to the existing name. Thus haplogroup H at some point split into H1, H2, H3 etc etc. Because the new number and letter is added as it is identified, it cannot be used to determine the age of the mutation. H2 was discovered before H3, but that doesn’t mean that the H2 mutation occurred before H3. It only means that modern man found it in that order. It began, apparently, with Mitochondrial Eve who lived somewhere in a time span of 101,000 years – somewhere between 200,000 and 99,000 years ago. That’s always the starting point so I’ll start there too, but it doesn’t really feel close enough to be family so I’ll move on quickly. 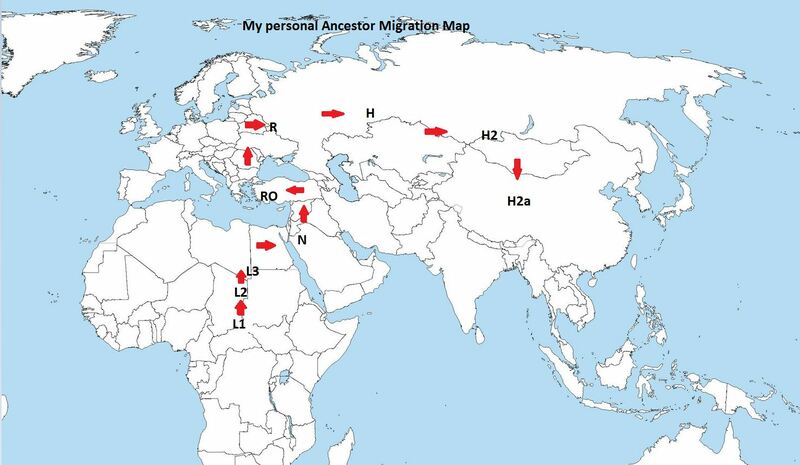 Haplogroup L was the beginning from what I can tell by looking at Wikipedia and other websites. There are still L1 women around today – the San women for instance – but at some point an L2 woman was born. 10,000 years later came an L3. Then, about 70,000 years ago, give or take 20,000 years, humankind left Africa. Around this time the first N Haplogroup woman was born. She was my ancestress too. It all gets a bit complicated from here, but at a time not very distant to the first N Haplogroup woman, came her many times great granddaughter who was born an R Haplogroup. Not to be confused with a Y-DNA Haplogroup R which is something completely different. This is an MtDNA Haplogroup R and it began, according to modern research, about 66.8 thousand years ago. This haplogroup is common in West Eurasia, so I can place my ancestress there near the Middle East. I still can’t imagine her daily life. What on earth did she do? Was it like ‘Clan of the Cave Bear’? Did she spend half her time climbing trees and avoiding deep water? I wonder about this because they are two quite instinctive characteristics of my own as a child. I had no brothers and was certainly not encouraged to be a tomboy, so the need to swing from the branches coupled with an amazing capacity to reach them must have come from some ancestor. I had no fear of heights yet deep water always bothered me. It’s a fanciful idea, but has appeal. None of this happened very fast, but once humans came out from Africa and started exploring, they took off in many directions at once. There is a bit of debate about where each civilisation was living at the time the next haplogroup developed. Populations headed into Europe. 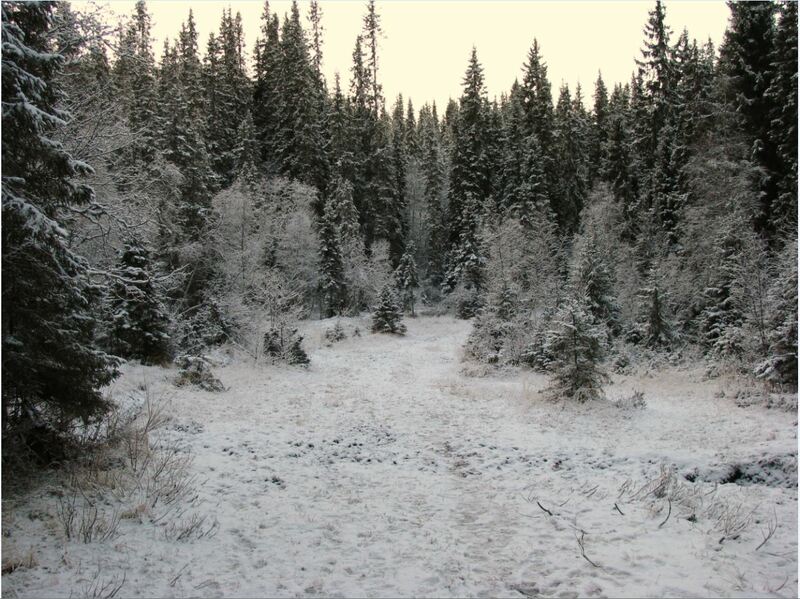 With the climate becoming colder they were slowly forced south and further east. The ice age drove humans into caves and on into new territory. 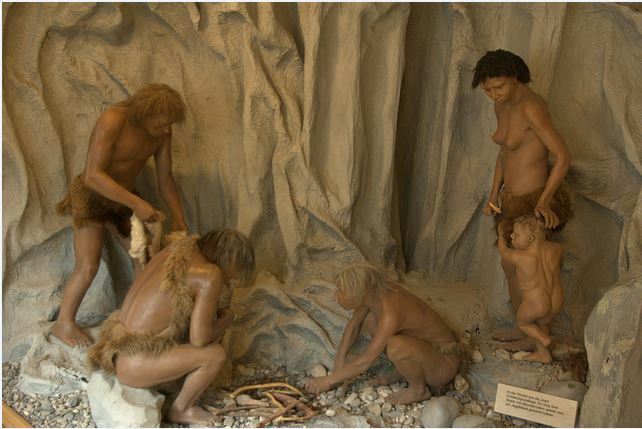 They met other races such as the Neanderthals. They took to wearing animal skins for warmth, and began to create shelters for themselves. Cave painting developed. They learned to carve little shapes out of bone. They learned to make rudimentary musical instruments. They had fire. The lifestyle was becoming recognisable. The theory of humans leading to the extinction of Neanderthals never appealed to me. I much prefer the intermingling theory and it is good to see studies continue. R evolved into three branches, one of which was RO. Several thousand years later, my last RO ancestor’s child was born an HV, At some point an HV gave birth to an H.
Haplogroup H is now believed to have developed in West Asia about 25,000 years ago, and can be found throughout Europe. When my H2 ancestress was born, they were in Eastern Europe. H2 is also found quite strongly in Germany and Scotland but my own branch of this family evolved into H2a, which is found in East Europe and into Central Asia. We must have headed for the British Isles at some time, but I’m guessing it was later than this. A lot more research needs to be done by scientists, and I’m sure it is underway. There are still big gaps in our knowledge. H seems to be the tough one, because it behaved so differently to the other haplogroups. The other ones are very stable but H mutated often. In a way it is a good thing. One day, we will be able to track the path of the haplogroups to within just a few thousand years because there are so many changes. More and more ancient remains are being tested now, to see what their haplogroup was. That information tells us a lot about which population was where in the world, and there have already been a few surprises – individuals found in places where they were not believed to have existed. It’s a time of very exciting discoveries. 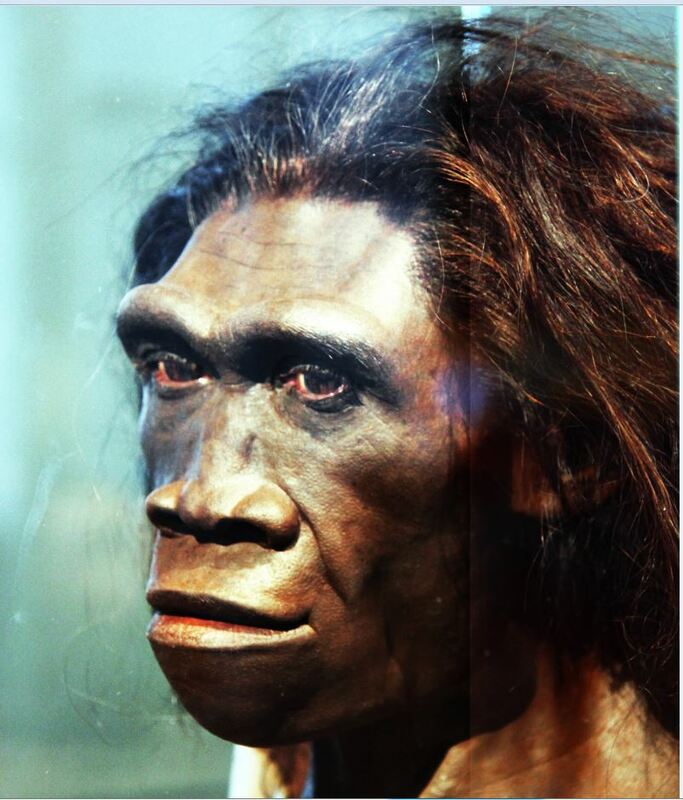 By the time my H2a ancestors were around, humans had moved beyond cave people. I can’t find any figures giving an exact age, but it looks as if this was about 15,000 years ago. We were farmers. Early townships were forming. Civilisations were beginning to pop up in China, Mesopotamia and India. The legend of Atlantis is set in this general time period. The study of my ancestors ceases to be geological and archeological and turns into actual history. 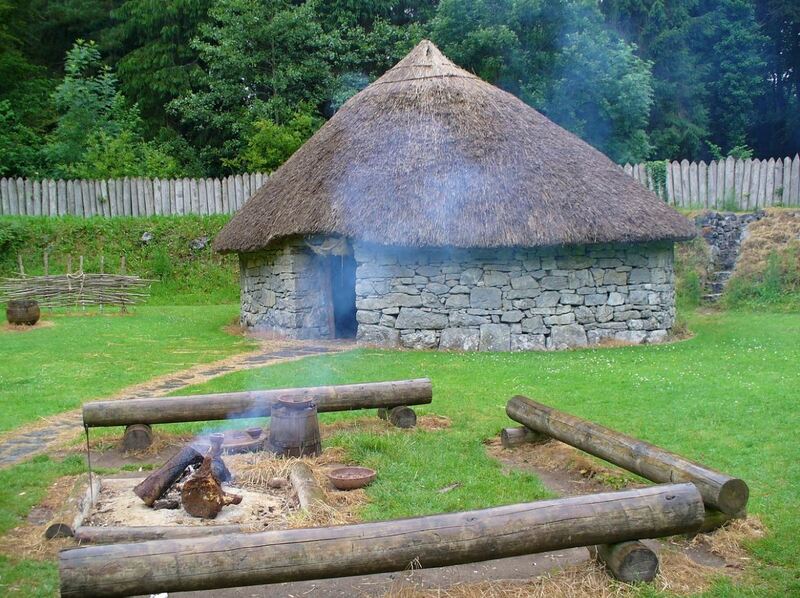 Image 5: Stone Age Hut replica. Picture by Katzbach from Pixabay.com under creative commons license 1.0. I too have taken the mtDNA plunge for both of my maternal grandmothers and gotten lucky as both of them have relatively unusual haplogroups. Fascinating subject! Yes, it really is fascinating, and becomes even better the more discoveries are made. I was quite baffled when the test results first came through, but I have my head around it a little better now.